The DBRC box serves as an optimal connection of a musical instrument with high impendance unbalanced output to a low impedance balanced input of a mixer. By means of the balanced connections to the mixer, interferences can also be avoided in case of long connecting cables. In case of problems with hum loops, the ground connections between instrument and mixer can be seperated by means of the ground lift switch. Then the devices are DC seperated. High signal levels can be reduced by means of the reductor and can be adapted to the mixer input. 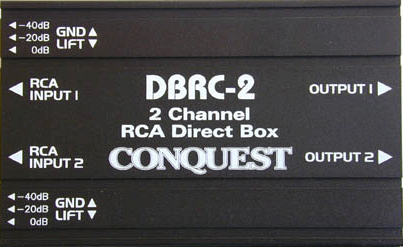 There by, the DBRC box can also be connected directly to the speaker output of an instrument amplifier. Consequently the influence of the sound at the mixer input will be maintained by the amplifiers. Direct connection of amplifier outputs with ratings of up to 125w at 8ohms, or 250w at 4 ohms. Heavy Duty aluminum housing, notched to allow stacking side by side or on top of one another.